On Wednesday night (3/4/13) night when I sat down, with mosquitos buzzing around my ears, and posted Setting up for an exciting few days in Katete, little did I know what kind of ‘excitement’ that would turn out to be. All the plans were in place to give the ColaLife Cairo to Cape Town cyclists a classic Zambian welcome in Katete. ‘Coke stops’ have been a feature of their mammoth trip, and we hoped to welcome them right outside the Coca-Cola wholesaler, with food and as much Coke as they wanted to drink. Some of our Kit Yamoyo promoters had come into town to tell the cyclists about their work and a couple of mothers had come to tell them how Kit Yamoyo had helped them. Katete is a quiet place – a small rural town on the main road through to Lusaka. So no-one had trouble on their mind. And why should they? At any time in living memory, our plan would have worked a treat. But not on Thursday morning this week. At 8am I rode out to meet the cyclists on their way in, and all was well. We met up about 8 km outside the town. An hour or so later the news reached us: there was full scale riot in the town, fires lit across the road and serious looting. 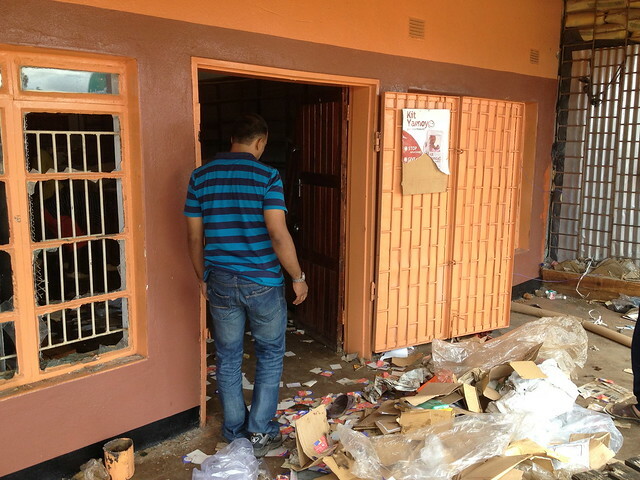 Our wholesaler was one of the targets of the looting – which was ferocious. All the windows of his shop were smashed and the steel door torn off its hinges. His shop was completely looted – there was not a single item left on the shelves. The riot was sparked by a particularly brutal murder of a 19 year old orphan girl. The people are unhappy about the lack of the progress in the investigation. Rumours spread, and they rounded on the businesses in the town, who are mostly of Indian heritage. When ‘mobocracy’ takes over in any culture there is always a tendency to blame minorities. This was no exception. This is a real injustice and particularly where Yahya is concerned. He is totally integrated into the community and speaks the local language. He is a mini development project in his own right supporting local causes including the local hospital and the sinking of wells in rural communities. He always responds to local appeals for help. He employs the guardian of the girl who was murdered and supported him with the funeral and in dealing with the aftermath of the murder. But none of this mattered when ‘mobocracy’ took over. As soon as things calmed down, the cohort of 50 cyclists were ushered through town quickly and were on their way. But I was left feeling very disturbed; this goes totally against the Zambia and Zambians I have experienced. As I drove out of Katete at 8am the next day all the mess around Yahya’s shop had been cleared away. The glass had been replaced and was sparkling in the sun like new glass does. The door was back on its hinges. Yahya was back in business. I have huge respect for this man. As our Kits are currently only on sale to registered retailers, they were stored behind the shop in another room – and as far as we know the 1,800 Kits in stock are safe. I really hope this was a one-off incident – feelings are obviously still running very high, and this is worrying. Here is the welcoming ‘committee’ that our cyclists missed. Damn! I am so sorry to hear this news. Maybe someone will speak up on his behalf and tell the people of Katete what good he has done. Don’t loose heart! We are all wishing you and Yahya the best. So sad to hear this news, SImon – Yayha was a hugely important part of the study CARE did with the National Food and Nutrition Commission in Katete, comparing the effects of giving food or cash for 8 months to clients starting antiretroviral therapy. He distributed the food baskets to clients, and then picked up the responsibility for distributing cash when the original service provider proved unreliable. He always treated clients respectfully and with dignity. What a terrible example of the injustice of the mob. I am so sorry to read your posting, I really do not know what to say! Ashamed and disappointed that fellow man can do this. Oh! 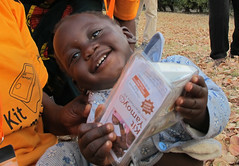 so sad to hear about Yahya who I knew a few years back when we did some community kit distribution. He has a lovely family.-Shame though and lets hope he carries on. Yahya was a friend and a great help for me in the two years I lived in Katete. 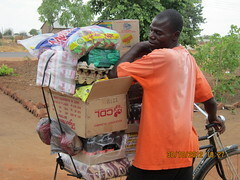 He gave lots of advice and insight, and helped source and transport materials for a community development project in my village. I’m so sorry this happened to him. It looks like much worse damage than what happened in 2011. He and his family are in my thoughts and prayers. Thank you all for your thoughts, wishes & prayers. Hopefully there’s a rainbow after the storm. Life has to go on. Maybe it will feel a little different, but time to get up, dust & carry on. Never show weakness in the face of a coward. Lessons learnt & many have come, very sympathetic, apologetic & sad at what happened to me, not all is lost. The under privileged & those in need of any form of assistance will always be welcome, service to humanity is service to God, thank you all once again. We were truly shocked and disturbed to hear that this happened in our home town – simply unbelievable. We all hope that you are well and recovering from this. It’s appalling to see how your kindness to the community has been rewarded. But at least you are safe, and the entire town will be in our thoughts and we hope things pick up again soon. The Parkinsons.